The sophisticated look of this modern take on the classic Winchester stalwart, almost makes the .270 load look “pretty”. 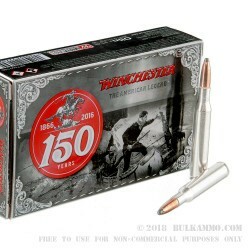 The modern performance and the classic versatility of the popular medium game round from Winchester Commemorative line delivers a spectacular hunting cartridge for use in any .270 platform. Featuring nickel plated brass and boxer priming, with a soft point, reminiscent of the classic hunting rounds from Winchester, but delivering hard hitting performance with the Super X power point (a proven entity in the hunting world). 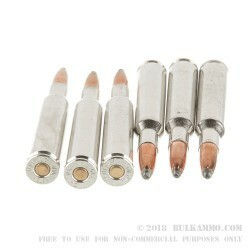 Reloadable brass; significant performance in the field producing 2850 feet per second at the muzzle and 2706 ft. lbs. of energy at the muzzle. A solid mid range projectile weight makes this a versatile field cartridge, truly presenting a hunter with the ability to buy a single load for their bolt action needs. 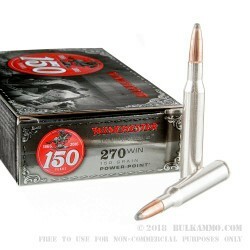 Capable of medium and large game performance, with a hard hitting proven projectile that retains good weight without having to use a fancy new engineered bullet. This is a classic load, delivering excellent performance from a classic brand that has always delivered excellent performance. 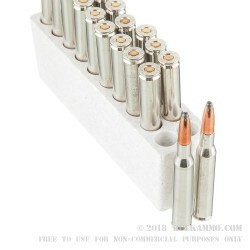 20 rounds per box; suitable for any .270 Winchester rifle.